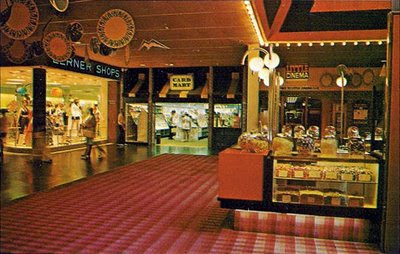 Whether your local mall is one of the growing list of America's dead retail establishments or is instead so busy at this time of year that visiting it is taking your life into your hands, let's all travel back to a time when malls were new. This was a magical time when small towns and mega-malls still co-existed like cats and dogs living together. A time when we all thought the limits of our consumption were endless, and these vast new stadiums of buying were a shining light on our modern economy. A time before the mallrats invaded! The date the "first" mall was built is kind of debatable, but it was not in the 1970's. Still, that was the decade the enclosed mega-mall really hit its stride. 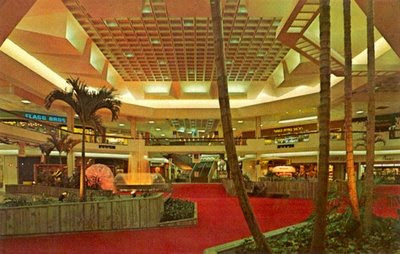 It was really the Woodfield Mall (1971) in Illinois that did it. We'd all heard of that mall, it was sort of the Mall of America of its time - a huge enclosed structure with hundreds of stores catering to an entire region of the state. And every county in the nation wanted its own mall just like that. Mall construction exploded. 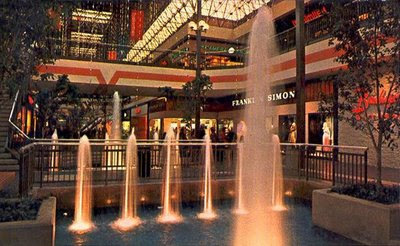 That's the Willowbrook Mall in Wayne, NJ, one of the largest around at the time. 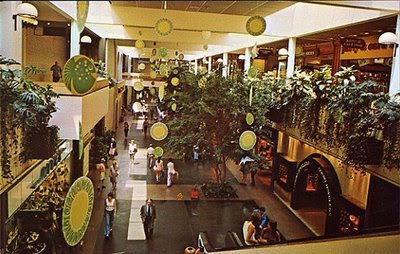 I more often haunted the Morris County Mall (now a strip mall), the Livingston Mall (now a "dead" mall?) 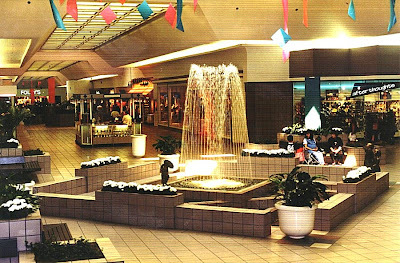 or the Rockaway Townsquare Mall (still going strong). 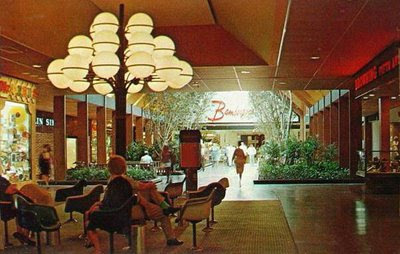 Dim lighting - malls in the 70's were dark places! As a balance to the somewhat cold architecture, lots and lots of plants. And I mean lots. It was like a forest in some of these malls. Here's an example - this is Altamonte Springs in Florida. They've even managed to fit in some wood paneling! Notice that all of these photos have kind of a yellow cast to them. That's not the film or the age of the photos; in those days, lighting in situations like this was either incandescent or that nasty yellow fluorescent stuff. These photos probably feature a bit of both. 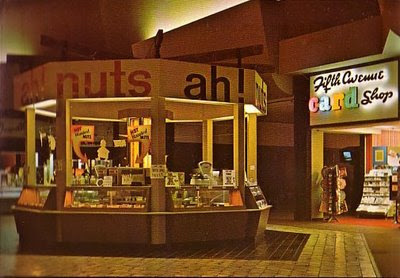 That's the pompously named "Mall at Short Hills" in NJ, the current incarnation of which opened sometime in the early 80's and was among the first of the "post-modern" malls, with an all-white decor, brighter lighting and fewer organic decorations, ie. plants. (A cost-cutting move, no doubt - somebody's got to water them.) This mall's been updated and expanded a few times since it opened, but it sort of set the template for malls going forward and it hasn't really changed all that much. 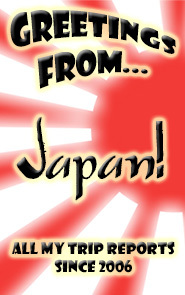 Is this actually inviting to anyone? The products just get lost in a sea of light. And it hurts my eyes to look at all that white. 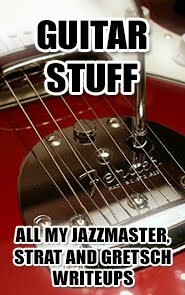 At one point in 90's, I had a collection of about 400 vinyl records, which I sold for $350 en masse to a guy I used to know. Had some rare stuff in there too. Needed to pay my rent. C'est la vie. Arcades in those days were more focused on pinball than video games, but towards the end of the decade you'd start to see stuff like Asteroids, Space Invaders, Lunar Lander and other video game machines popping up here and there. It was the beginning of the golden age of the arcade. I'll talk more about that later. 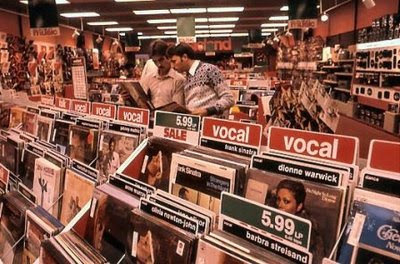 In the late 70's, my parents would take me to the mall every week and give me my allowance so I could go to the record store and the arcade. Yeah, one of those parental tricks to get me out of their hair for a few hours. Sometimes I wouldn't find anything I wanted at the record store, so I'd have about $10 to spend in the arcade, and back then that was enough to last for the whole day. As I grew up, I started taking a free bus and then later driving myself (and friends) to the mall each weekend, and I would still hit the record store and arcade every time. It was a ritual that lasted probably until I was 18 - about 1990. Of course I hate going to the mall now. Absolutely despise it. I've changed and the malls have changed. In New York City, there are only a couple malls to begin with - the Manhattan Mall, which is an absolute dump, and the Queens Center Mall, which isn't much better. (If there are more, I don't know about them.) Both of these are like eight stories high to make up for their lack of floor space. And they're always jam packed even though about half the stores are vacant. Out in the suburbs, where I technically now live and where it's usually a lot more pleasant to do pretty much anything, I still avoid malls like the plague. The closest one to me is the same mall where that Wal-Mart trampling death happened - that should tell you something. 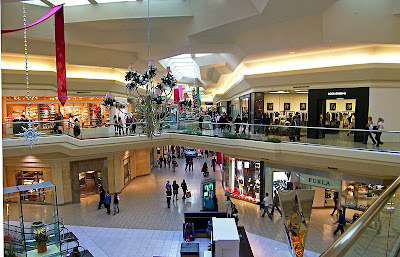 If I do go to any mall, it's usually Roosevelt Field in Westbury, which is the largest mall in New York State and easily the most overcrowded. It's an absolute nightmare. I'm talking lines to get into the bathroom at 3PM on a weekday. And of course it's as ugly and whitewashed as every other mall these days. Whether it's overcrowding or undercrowding, most malls these days just can't seem to get the balance right. Yet some people still think malls are the future. You know what I say to that? By the way, here's a great site showing photos of malls from the past (a couple of the ones above are shamelessly lifted from there). Doesn't look like he's updated for a while, but he's got years worth of stuff to look through anyway. Australia tends to trail the USA in maatters marketing, so these stories are a little closer to the present for us. Sometimes it's like getting a glimpse into the future of what our attitudes to shopping will be like. Great stuff. I, too, am a product of the late 70's mall, and believed it to be a wonderland unto itself. Arcades and Shakey's Pizza and chicks in bell bottoms. If only my time machine was operational. Those photos are brilliant. I forgot how much the lighting has changed. The 70's were lots of laughs, to be sure. Anyway, thanks for the good memory jog!